I never did play any of the Zynga games while my Facebook account was active, but a couple of months ago, I heard loud whispers about a game called Words With Friends. The game itself was not impressive since it was just a Scrabble clone. What was impressive was that I could play with anybody that had a iPhone, iPod, iPad or Android phone. This feat has rarely been done. 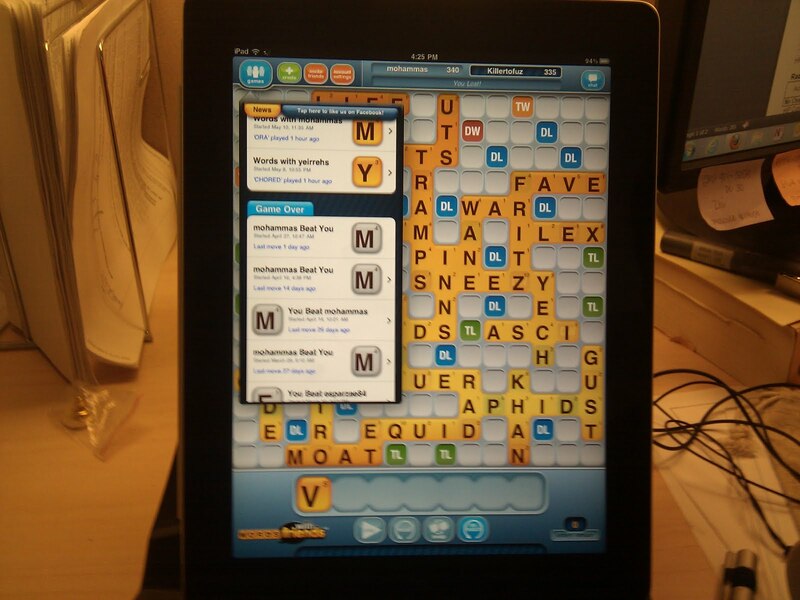 However, the problems started after I would play a game of Words With Friends. Zynga put no effort into creating a win-lose record statistic, let alone a ranking system. I did see that Zynga put a lot of effort into placing many intrusive aka "I'm taking over your screen" advertisements. Without a win-loss record, I felt like a victim in endless loop. What was I playing for? This was 10x worse than being addicted to World of Warcraft, because at least in World of Warcraft I saw my "achievements" in the might of my gnome warlock. I was playing Words With Friends for the "high" of the moment which I could only get if I took another "hit" through playing the game over and over. I felt that if I was putting in so much time, I should be rewarded with an achievement such as a win-loss record, even a bad record is better than no record. A bad record could challenge me to get get better and I would attain satisfaction through this process. 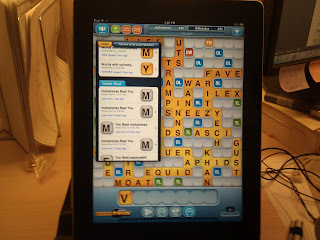 Thus, I started to think about the motivation behind the makers of Words With Friends, Zynga. I had heard complaints about them through a techcrunch.com writer, Michael Arrington, about how they scam customers, click here for article. Zynga generates revenue by having people take surveys, sign up for credit card offers, and buy credits so that their "cooldown" for a given game recovers faster, allowing a player to do missions right away, instead of waiting for hours. While most players do not engage in these tactics (i.e., buying energy to reduce a cooldown), it is disheartening that you can get ahead in a virtual world by tossing around real world money. I have never faulted a company for going after money, it is their right and without the money they would not exist. What I do fault is the zeal certain companies go after money (i.e., AT&T). There is a delicate balance of being profitable and genuinely caring about consumers, which some companies have achieved (i.e., Blizzard). In the end, I did not trust Zynga, so I deleted Words With Friends.